Santorini weddings are for the hopelessly romantic !!! Making introductions for this Aegean gem, we believe, is unnecessary. We have all seen postcards of the most accurately representative island of the Cyclades travelling all around the globe and we all want to go there- why deny it? When the boat approaches Santorini, the unique black and red volcanic landscape in sharp contradiction with the dispersed white houses all over the island is captivating every traveller’s attention. The magnificent view that unfolds in front of our eyes, when we go there, still manages to elicit the same awe and romantic feelings every time. So, what better choice than having your wedding in the most enchanting island of the Aegean with colourful cliffhanging houses and the endless blue surrounding you? Having a Santorini wedding is as good as it gets! Needless, to say that you can always enjoy the most glorified sunset view from Caldera and in that moment, you will realise the little piece of heaven, Santorini is. Let The Twelve Events team help you in making your wedding in Santorini an unforgettable experience for you and your guests. 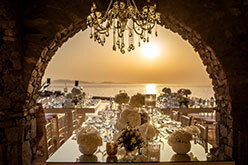 With more than 15 years experience in the wedding planning field and numerous destination weddings, we believe we can make your dream wedding in Santorini a mythical experience. Choose the island that magnifies your senses with its extraordinary beauty, the incomparable wine making and gastronomy tradition and let us do the rest! Santorini weddings are as picturesque and magical as they sound..
Live your hopelessly romantic wedding in Santorini!